Fears about irreversible deforestation and fuel wood shortages prompted the colonial and later national governments of West Africa to set up protected forests across the region. The Ouénou Bénou Forest Reserve is one such example from the woody savanna zone of northern Benin. An area of 300 sq km was set aside in 1943, in which land use rights were restricted to the collection of dead wood and wild fruits. Strict measures of forest protection were enforced initially; however, under the pressure of a fast growing population, linking environmental conservation with ensuring people’s livelihoods has become a challenge. Shortcomings in the implementation of forestry laws have been exacerbated by an underfunded forestry department and a lack of qualified staff and surveillance personnel. As a result, protected forests have been subject to uncontrolled bush fires, illegal exploitation of wood, and clearing for agriculture. 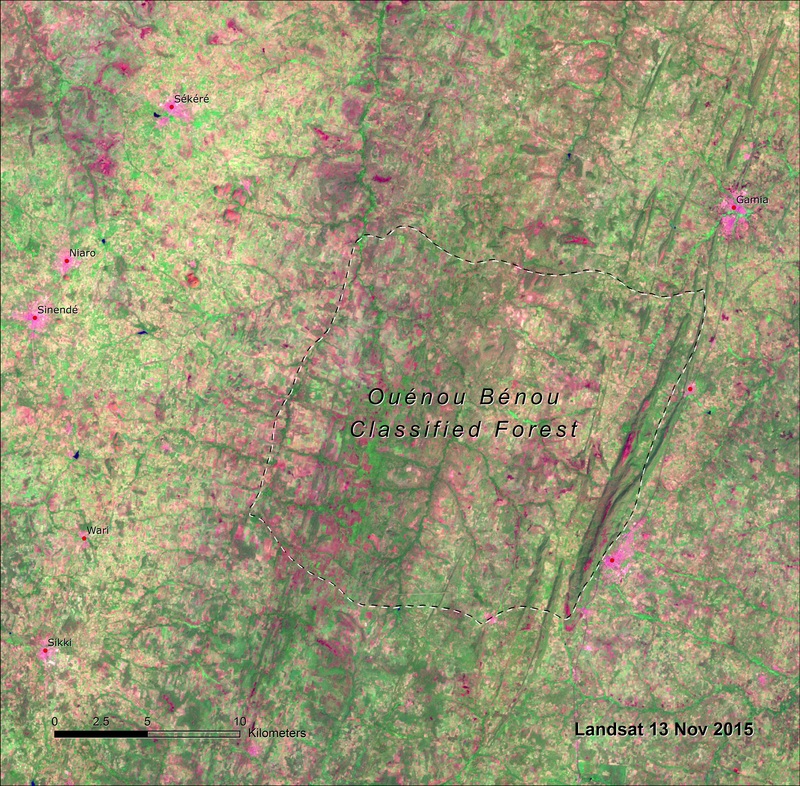 Landsat imagery from 1986 and 2015 shows the encroachment of farmers’ fields (light colored patches) both outside and inside of the protected forest of Ouénou Bénou. Inside the forest reserve, virtually no agriculture (less than 5 percent) was visible in 1986. 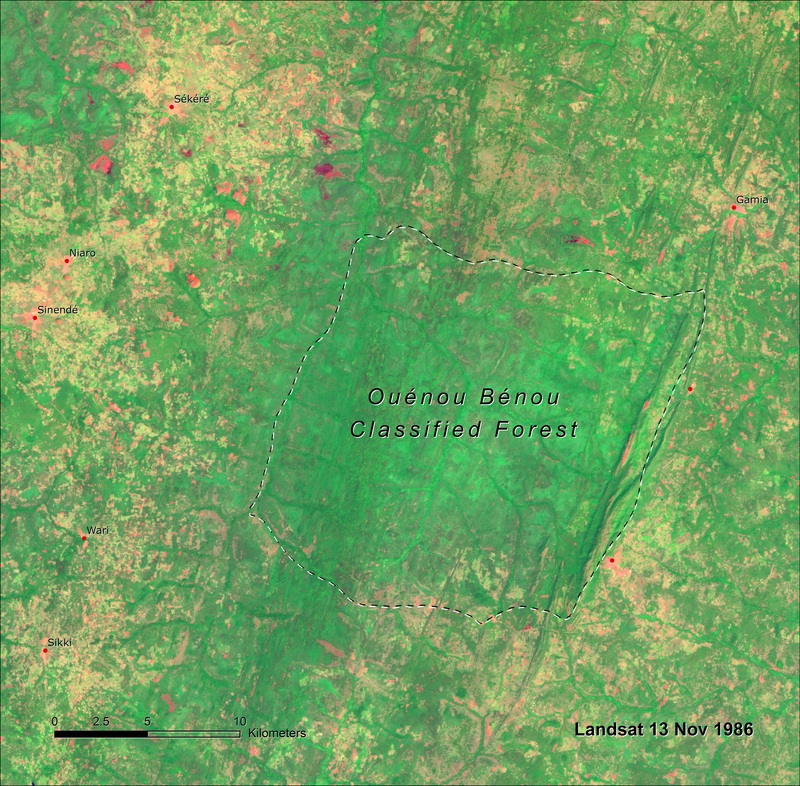 By 2015, the protected forest had been massively encroached, with more than 50 percent of its area cleared for farming. This land cover transformation affected gallery forests located along the drainage network and wooded savannas. It has largely been driven by an agricultural policy aimed at increasing agricultural production at any price, and a lack of coordination between the agriculture and forestry departments. Incoming migrant farmers were encouraged to cultivate in the forest reserve, where soils were still fertile. The population of the rural communities of Bembèrèkè and Sinendé, the majority of which practice subsistence agriculture, are aware of the environmental cost of the deforestation: a loss of certain woody species that are used in traditional medicine, increased soil erosion, and progressive impoverishment of soils. On the other hand, they also draw some benefits from the agricultural expansion. The increased agricultural production has positively impacted food security, and the cultivation of export crops, in particular cotton, created income opportunities for some. In order to allow for a more sustainable exploitation of the lands, which support livelihoods without depleting tree and forestry resources, a new forest management approach is needed.